The wail of an ambulance siren announces the arrival of a trauma patient to the emergency department. Paramedics unload an injured woman from their ambulance and rush her towards the emergency department. Inside, a team of doctors and nurses await, ready to deal with her life threatening emergency. Intravenous lines are started to administer life sustaining medication, breathing tubes and chest drains are inserted and scans are performed on all parts of her body. “Call the operating room, we are coming up STAT!” is the consensus from the doctor in charge. As paramedics and emergency department personnel fade into the background, a new team of doctors and nurses in the operating room take over the young woman’s care. After three hours of harrowing surgery, her vital signs stabilize, and she is transferred to the Intensive Care Unit. In all, more than 50 people will be involved in her care in the first five hours after her car crash. The efficiency and skill with which the team functions in this high intensity environment is the result of years of training and experience. This article will share some of the new methods that trauma professionals are training with today in order to provide assistance to people who suffer life threatening injuries requiring advanced medical care. Education in trauma care has evolved enormously over the years. Training can range from a weekend refresher course to yearlong training “fellowships” for subspecialist trauma physicians. Many of these educational experiences are essentially an apprenticeship where doctors, nurses or paramedical personnel learn their trades by a system of graded responsibility, initially observing senior colleagues, later assisting, and finally, performing the complex tasks on their own. In addition to the technical skills required by medical personnel involved in trauma management such as the placement of life sustaining breathing tubes, medical educators are recognizing the importance of expertise in nontechnical skills in addition to expert technical skills. Non-technical skills emphasize the importance of human interaction in medical emergencies. Advanced medical care is universally provided by a highly functioning team of people. The model of the operating room is a perfect example of this: in order for a surgery to be successfully performed, a team of doctors and nurses must work seamlessly together, communicating in a language and according to a set of rules that they all abide by. While each individual must be an expert in their specific technical field (i.e., surgery, anesthesia and nursing), they must all have expert non-technical skills too (i.e., leadership, communication, delegation, cooperation). Prior to this decade, non-technical skills were not routinely taught to trauma care providers, however, this is changing as educators recognize the importance of strong teamwork and communication in high stakes medical situations. How do we teach and practice concepts like “team work,” “communication” and “leadership” to trauma care professionals? It is widely held that non-technical skills are best taught by “doing,” but is it safe to let a novice trauma care trainee “practice” on a patient who is unstable and near death? Clearly the answer to this question is “no.” Trauma care is high intensity and time pressured; complex decisions must be made by individuals and by the team in seconds or minutes in order to save patients’ lives. High fidelity patient simulators may hold the key to teaching technical and non-technical skills to junior trainees. High fidelity simulation is a training method long employed in industries such as aviation and engineering. In commercial aviation, professional pilots participate in regular training on multimillion dollar flight simulators. These simulators replicate emergency in-flight scenarios so that pilots can practice their responses to emergency situations in the cockpit. Their training includes nontechnical skills such as communication skills and leadership in a crisis situation. Similarly, medicine is using this model to teach these same non-technical skills in trauma care. Air medical crews working on rescue helicopters rehearse their treatment protocols for trauma patients inside the modified fuselage of a helicopter that doubles as a classroom. The inside of the mock-helicopter cabin is identically configured to their usual rescue aircraft, except that there is a mannequin in the stretcher in the place of a real patient. High fidelity patient simulators are being used in hospitals throughout the world to teach similar skills to physicians and nurses. Trauma is multidisciplinary by nature; patients commonly have multiple injuries and the trauma team leader must be able to work with his team to rapidly assess, simultaneously treat and diagnosis injuries, and quickly create a resuscitation plan that will involve multiple medical specialists. High fidelity patient simulator laboratories are designed to replicate a trauma bay or operating room almost identically. These rooms will have real equipment, medication, anesthetic and surgical equipment, as well as a highly sophisticated mannequin that provides biofeedback to the doctors based on their treatment decisions during the simulated scenario. Mannequins can “breathe” and “talk,” and trainees can perform procedures similar to real trauma situations. Trauma teams are able to rehearse their coordinated response to a complex trauma patient in real-time. The mannequin’s vital signs (i.e., heart rate, and blood pressure) can be made to improve or deteriorate depending on what the instructor is trying to teach the trauma team. Classes are video recorded, and after the case is completed, a debriefing occurs allowing the team to critically analyze their performance. 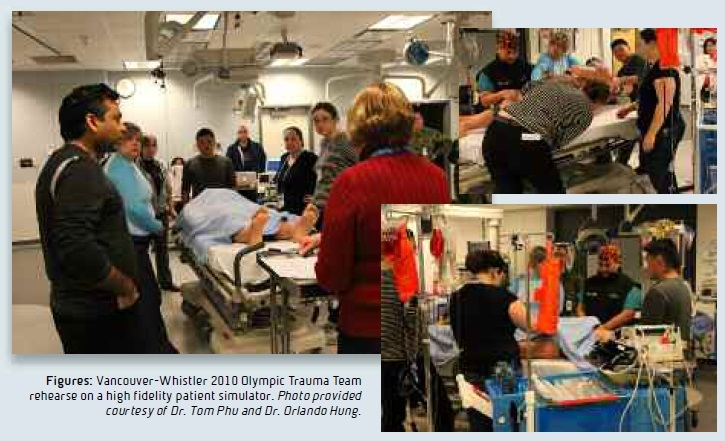 This trauma training model was used to prepare the multidisciplinary trauma teams for the Vancouver-Whistler 2010 Olympic Games with great success. Trauma is a dynamic, high stakes specialty of medicine that requires the coordinated, specialized technical and nontechnical skills of multiple specially trained medical personnel. New educational tools, such as High Fidelity Patient Simulators, are helping trauma care educators train the next generation of expert trauma specialists. 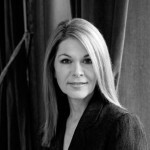 Does Content Matter? Which virtual environments do we need for pain management?